When considering a cabinet style parts washer and pump sizes, it is important to consider the Power Density. As shown below, Power Density is the amount of cleaning energy in horsepower per cubic foot of cabinet work volume. Higher Power Density provides more cleaning energy in a given work volume. 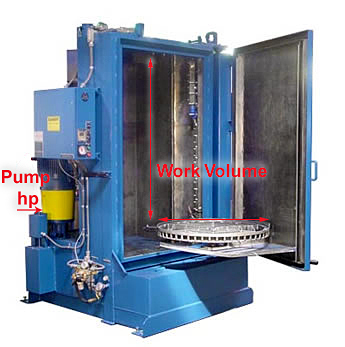 Power Density drops off significantly as the diameter or height of the work area increases. This change occurs at an exponential rate. It is interesting to note that a 3040 part washer using a 5 horsepower pump delivers more cleaning energy to the work volume than 140 horsepower pump on a SR12090 parts washer. Using Power Density information, it is easy to see that a 60112 parts washer requires a 55 hp pump in order to have equal mechanical cleaning energy as a 10 hp on a SR3040 Parts Washer. Remember, when you are considering different pump sizes available in any Parts Washer, consider the Power Density to insure you are getting the cleaning you need. StingRay application specialists have a wealth of proven power density applications to guide your selection. Note: Power Density is the amount of horsepower of cleaning energy that is available per cubic foot of working volume. Power Wash Process - what is so special about it? The SHIM allows you to clean your tallest parts as well as smaller loads that need a higher power density for cleaning. Both with a simple turn of a valve. The SHIM is like two machine work heights in one. The Center Manifold washes interior surfaces while the Power Blast Manifold (PBM) cleans the exterior. These systems allow the operator to adjust the system's power density at the wash nozzle discharge.